This week in my classroom students are listening to one of my favorite read alouds, My Father’s Dragon by Ruth Stiles Gannett. 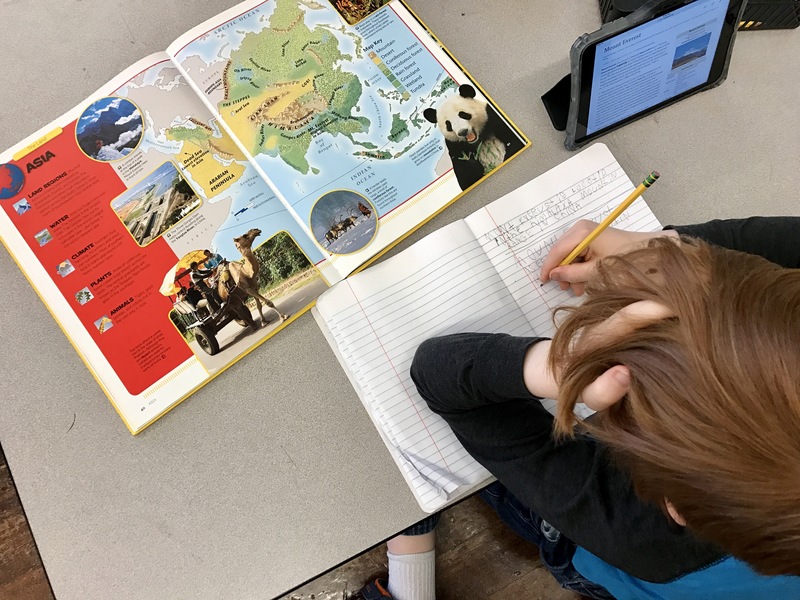 We’re reading a chapter a day, working as a class to infer word meanings (weep, cargo, inhabited ) pausing so that students can turn and talk about the storyline and share their understanding of the text. We started by making predictions about what would happen in the book. Why is there a lion on the cover? Why did Elmer pack what he did in his knapsack? But instead of just writing these predictions on paper, and turning them in for feedback, my students are using Twitter to share their learning with classrooms around the United States and Canada. For the third year in a row my 1st graders are connecting with other 6 , 7 and 8 year olds in more than 20 different classrooms using the #1bc18. My students are used to sharing on Twitter. In fact, our class Twitterers, (there are two) is our most popular class job. Most days these students will send out a tweet at the end of our day. It’s their chance to share what they think is most important about our school day. These tweets are student directed. My 1st graders use their best guess spelling and they use our school hashtag (#QAE) because they know hashtags bring specific audiences together. I don’t step in until their finished, and then I read it, offer feedback and let them tweet it out to the world. What’s most significant about this is that they are sharing their voices with an authentic audience. During the book club, my students are literally lining up in front of our classroom computer so they can share their predictions, thoughts, etc. about the chapter we are reading. And because we are on the west coast, and 2 to 3 hours behind most of the other classrooms that are online, we are able to see what what other students are doing which creates a lot of excitement that help push my students in ways that I alone cannot. It is a connection that is authentic and motivating. We are also noticing similarities about our thinking and about the schools and classrooms that we learn in. We have gotten out maps and put dots on the cities and towns that we now have a connection to, we feel like we have made new friends and we’ve added geography to the 1st grade curriculum. I am very passionate that every student should be learning how to use technology and social media in school. My own kids (now 18 and 21) were the 1st generation of kids to grow up in this new digital world and they were navigating social media with very little support from adults (I thought I knew what they were doing ) and absolutely none from their teachers. In fact, students were banned from bringing technology to school and were only told what they couldn’t do on school devices. I believe that the students that are in our classrooms now will be more thoughtful and positive on social media. And that they will not only be digital citizens but digital leaders who will use technology and social media to create positive social change. This today from one of my 1st graders who wanted to share her feelings about the thousands of students who walked out of schools everywhere to honor the victims of gun violence. If there is one thing that drives our teaching, it’s giving our students choice in the classroom. My students pick where they want to sit, they choose who they want to work with and with minimal exceptions they are all working on different skills, strategies and goals during reading, writing and math workshops. They show their learning in different and creative ways and they understand that every single choice they make impacts their learning. Alicia and I teach 6 and 7 years old and yet they understand what it means to be a self directed learner. In our classroom this 21st century skill is explicitly taught. I understand and follow classroom routines. This sets the foundation. My students walk into a fairly bland classroom on the first day. There are no assigned seats, no name tags, there are no colorful bulletin boards, no jobs posted, there are no anchor charts on the walls with guidelines for behaviors. In the first 4 to 6 weeks we will create all of this together. Students will help craft our classroom routines and make agreements so that we can spend each day with one goal in mind and that goal is to learn. And because they have input into how our classroom functions there is a lot of student buy in. 6 year olds want to learn and they want to have fun. And surprising they want structure too. I work independently for short than longer periods of time. Alicia and I believe strongly in the workshop model and we teach reading, writing and math workshops. The structure is predictable. A short mini lesson on the carpet, followed by ample time to practice independently and then time at the end for reflection. At this point in the year my students are reading self-selected texts for 25 minutes each morning. They are writing for close to 40 minutes a day. They pick their own books based on interest and their ability to read it. On any given morning you would see students independently working on spelling patterns, writing a blog post, using bananagrams or spellominoes to make words or using their iPads to record a video blog in which they summarize a text of their choice. I am setting learning goals and persevering to meet them. All of my students set learning goals. These goals are sometime set with me and very often set on their own. Because creating a mindset for learning is also a big part of our curriculum, many of my students will pick a goal around perseverance and persistence especially in subjects that may be hard. Learning to not give up and to be resilient are life long skills that will serve them well. But becoming a self directed learner doesn’t mean anything if students aren’t allowed some time to explore their passions. My students look forward to Wednesdays because they know that on this day they can pick anything they want to learn about. As their teacher, Wednesday means they are reading and writing and researching topics of their choice. But to them in means they are in total control of their learning, they pick the topic, they ask questions, they make a plan to share their learning. They are empowered. They take risks. They make mistakes. They begin again. It’s what school should be. For many years, I began the first day of school reading books to my class about being excited and nervous for first grade. As the days progress there are even more books about how first grade might be different than kindergarten, fairly typical start of the school year literature. Two years ago I decided to change all of that. Over the summer, Molly had recommended the book A Mindset for Learning by Kristine Mraz and Christine Hertz–this book has had the most impact in my classroom of any teaching book I have ever read. It outlines growth mindset learning traits to use with both primary and intermediate students. If you have not read this book yet, do so! The first stance I decided to teach my class, starting the very first day of school, was optimism. The book gives student friendly definitions to use with each stance. The definition of optimism fits perfectly with the first day of school. “When you do something new, you think “I can try” and give it your best shot because that is how your brain grows.” Many times coming into first grade, students are nervous and scared and unsure they will be able to do it. Many are just beginning to read and are intimidated by peers who are already reading. While there is nothing wrong with starting the first day of school with books about the first day, why not empower students with tools they can use for the rest of the year and their life? We began that day coming into the classroom after the usual goodbyes to moms and dads and maybe few tears and gathered nervously on the rug. After sharing a little bit about ourselves, I introduce the definition of optimism and explain that in the text we are about to read, we are going to watch for when the character displays optimism. I do not have the picture of the text under the definition yet, I wait until after we have explored the text several times and then print a small image of the cover out to for reference. The text I used this year is Jabari Jumps by Gaia Cornwall Jabari Jumps is a story about a little boy who wants to jump off the diving board but is scared to do so. Again, if this book is not yet in your library, run don’t walk to get it! As we read, we stop and discuss where Jabari is showing optimism. The discussion that follows this text was very powerful. Students really saw themselves in Jabari and made connections to times they had used optimism in their own lives. Throughout the week, we revisited Jabari and the learning stance of optimism. Within a day or two, I heard students complimenting each other for “trying optimism” when they did something new. Growth Mindset is a popular term in education currently and deservedly so. By teaching students learning stances such as optimism, we empower students to take charge of their own learning and lives. Mindfulness In the Classroom – How my 1st graders taught me that slowing down is good for all of us. “I am aware. I am safe. We are connected. These 3 simple statements had a huge impact on my classroom. They were proposed by my school’s climate committee as a way to help all of our students be more mindful. (Not only in the classroom but in the halls, on the playground and in our overcrowded and very loud cafeteria.) Social Emotional Learning is already at the heart of my school’s curriculum. We explicitly teach students how to recognize, understand, and express their emotions. We give them tools to help them self-regulate. In every classroom at Queen Anne Elementary you will find calm body spots – spots that students can go to if they need a break. (Not sent to – as a time out) Students have access to noise canceling headphones, a variety of fidget tools and other materials that help them focus on learning. We believe that our students have different needs and there is no “one size fits all” approach. Our classrooms have flexible seating so that students can pick a space that makes sense for their needs. We give all of our students the power to make decisions that help them learn best. We have daily classroom meetings run by the students with agendas that include a complement circle and problem solving. So when our staff decided to make these 3 simple statements a part of our common language I wasn’t sure they would add that much more. But they did. They became a kind of mantra in my classroom that helped students become more calm and focused on learning. It started when one of my students, whose job that week was the Class Breather, (this is a coveted job in my classroom – the student uses a Hoberman sphere to lead us in deep breaths when needed) decided we should say these statements after each breath. It was an idea that stuck. And the more I watched my students, and did the same practice myself, I saw we were all benefiting from this 3 minute activity. My students were more calm. My most fidgety students were able to focus longer. And we felt more connected. But there were other ways I was incorporating mindfulness in the classroom. For the last 2 years I have integrated the mindset for learning strategies so skillfully laid out in Kristine Mraz and Christine Hertz’ incredible book called A Mindset for Learning- Teaching the Traits of Joyful, Independent Growth. These mindsets – empathy, flexibility, persistence, resilience and optimism, are taught explicitly and my students use these mindsets throughout the year. I see evidence of it everywhere. They come up during goal setting, in conversations and on sticky notes that are left in books. I also started using Go Noodle. Go Noodle is a website that features short videos designed to get kids moving. But they also have videos that teach mindfulness, specifically ways to enhance focus, practice compassion, build self control and manage stress. I turned to Go Noodle after I realized that my kids were returning to the classroom after lunch (remember the previously mentioned overcrowded lunchroom above?) extremely amped up. I tried everything – A class read aloud, a moment of silence, a time to just sit and draw. Didn’t work. The energy level was too high. One day, I turned down the lights, met the students at the door, asked them to find a brain and body spot and when we were ready I would play a Go Noodle mindfulness video. My students just naturally started sitting Criss Cross Applesauce and using the time to shut their eyes and think about their breath. When all or most of us were ready – they would either continue sitting or standing depending on the video. And again this was 3 minutes of our day that made my kids less stressed and ready to take on the 1 1/2 hour of Math and Science still to come. And I’ll be honest these brain and body breaks were helping me as well. I found I was more calm and was a much better teacher in the afternoons. I’m excited to hear other stories from educators who are seeing the difference that a few mindful minutes can make in the lives of their students. I have been catching up on the Innovators Mindset Open Online Course and it didn’t take long to inspire me to start blogging again. It’s so easy to be so busy that blogging just isn’t a priority. Teaching, family, staff meetings, parent meetings, National Boards, etc. etc. But when I start listening to innovative teachers share their practice, my head starts spinning and I want to share what I’m thinking too. So often we feel like we don’t measure up. So here I go. Again. There are many things that make a teacher innovative. Because I value collaboration, face to face, and with people I’ve never met, communicating using 140 characters or less – I’m innovative. Because I take risks in my day to day practice -I’m innovative. Because I learn from my mistakes-I’m innovative. And because I give everyone of my 1st grade students the support they need to make choices and take risks in their learning – I am innovative. But the hard part about being innovative is that nothing stays the same. I can’t rely on what worked last year or the year before because ever school year brings a new group of students. And a new set of challenges. Right now I’m struggling with We Wonder Wednesday. This is a day that I set aside for my students to learn about anything they want to. They can work by themselves, they can work in groups – they just need to be learning. I have students, 7 and 8 year olds, researching fish, dinosaurs, Michelle Obama, plants, bubbles, Mt. Everest and binary numbers. ( crazy, I know.) And they are learning. They are picking a topic , doing basic research, and then creating a poster or a book, often using technology, and moving on to the next wonder. And then they repeat. Why aren’t they taking more risks? Is it them or is it me? By now my students have learned what it means to be a self directed learner, they know what it means to think critically and share their thinking. And we have also defined what it means to be creative. For me being creative, means not showing your work the same way again and again. And that involves taking risks. Are all my student able to do that? I don’t think so. So is it me?Or is it them? What am I missing? 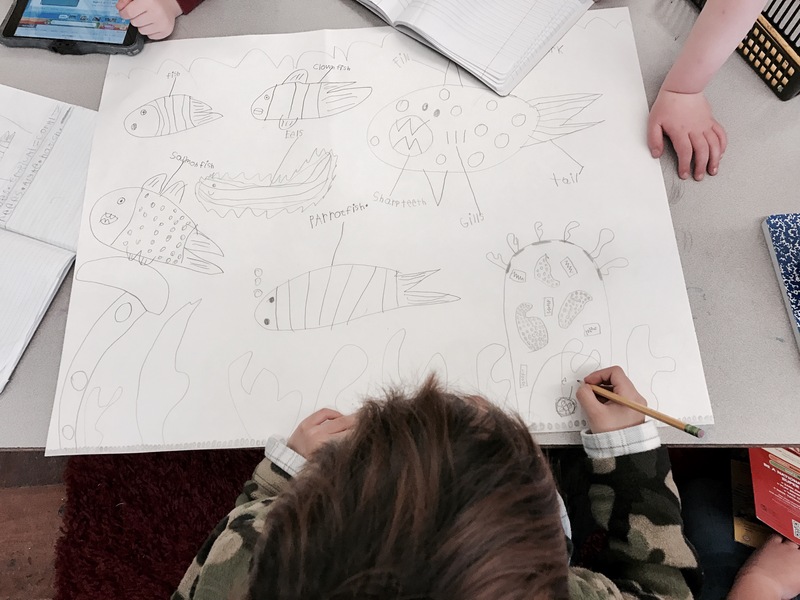 Are students just picking a topic and saying, “OK, today I want to learn about fish? Or are they asking questions, after all wonder means to be curious about something. They shouldn’t be picking a topic. They should be asking questions. And if they don’t have a lot of questions about a topic, then they should find another topic. One they are passionate about. Maybe that is what’s missing. Passion. How do we create a classroom where children are passionate about their work? Giving them voice and choice, time to wonder and ask questions, is a good start. But how do we model passion? That might be the key to innovation. So this Wednesday, I will remind my students how I wonder continually-when I’m making my coffee in the morning, on my drive to work, while I’m teaching, and most especially on a walk when I’m catching up on conversations about innovation in teaching. I will remind them how passionate I am about learning and sometimes that means taking more risks, looking at things, even learning in a new way. To do this we will need to be persistent, resilient and flexible.We will need to push ourselves to think differently about the world. And if I can teach them that – I can consider myself innovative. What if we believed that every elementary school’s responsibility was to teach social and emotional learning skills as explicitly as we teach reading, writing, math and science. What if we all believed that developing social-emotional skills in children is critical to their academic success. What if we gave every student a voice. What if teachers made their learning space accessible for all learners. What if we held regular classroom meetings to have meaningful conversations about the way teachers and students work together. What if we explicitly taught students how their brains work. What if students used brain science to help them gauge their emotions and then provided them tools to help them regulate themselves so they could get back to work. What if there was no shame in having a bad day. What if every classroom had a calm body spot where students could go when they needed a break. What if every child knew that mistakes are an important part of learning. What if every child had a job in your classroom. What if we lifted expectations for every child. What if, given this focus on social emotional learning, our children were more successful. What if, given this focus on social emotional learning, our children learned empathy is one of life’s most powerful tools. Because when we connect with others we are compassionate, concerned, citizens of the world. What if, given this focus on voice in the classroom, our children felt empowered to learn in and out of the classroom. This year I am teaching a first/second multiage classroom. This is a new challenge for me and while incredibly exciting, it is also incredibly time consuming. All this to say, I missed the last weekend IMMOOC and then on Monday morning, Molly came in raving about it and I realized I had majorly missed out. Well not this week, I woke up and tuned in to watch Shawn Clark and Brady Venables discuss how they are creating innovation in their own district in South Carolina. I was so impressed to see two district leaders talking about how they are still pushing and challenging each other to be in classrooms and teaching even though they no longer have classrooms of their own. Their conversation got me thinking about my own teaching experience through the innovator’s mindset lens George Couros talks about. This is my tenth year teaching and my fifth year at my current school. One aspect of my teaching that I am proud of developing is a comfort with risk taking and this has happened because there is someone right next door to me willing to do the exact same thing. Molly and I connected instantly when I was hired, I think at the time because we both taught math in a similar workshop manner. However, what I quickly found in Molly was someone who was willing to listen, push and take risks right along side me. And this connection has allowed me to feel comfortable with taking risks and the failure that may sometimes occur. Simply put in Molly, I have found my people. And watching Shawn and Brady this morning, I realized the power and the need for all teachers to find their people. When you find a person that pushes you, encourages you and reflects with you, your teaching becomes so much more powerful. Part of having an innovator’s mindset, in my opinion, is finding your people without a person who is walking down that same path with you, you are way less likely to take risks, to know failure really isn’t failure if you reflect and learn from your experience. I know that there is no way I would have been able to develop a true Innovator’s Mindset without Molly. So my challenge to everyone reading is to find that person or people. If not at your school, in your district or maybe through a twitter PLN. When we find people we truly connect with, we grow so much more in our teaching and our students and our school community benefits.